As a 6 month old . . . In full rut! What a looker! Renoir just keeps getting snazzier & snazzier . . . so snazzy that we couldn’t help but to keep him, even though we’d already retained a paternal brother as Junior Herdsire! His dam Rose is an all around wonderful doe, derived of Superior Genetics and is a proven producer of consistently terrific offspring. 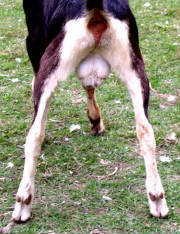 We felt that the breeding with Jrufio would be an excellent one . . .tried it twice, got bucks both times so . . . decided that perhaps it was “a sign” we should heed! 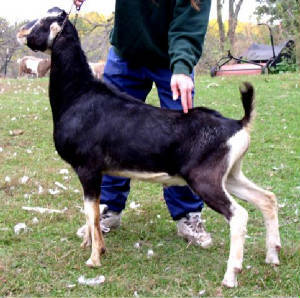 2003 maternal brother, Rogue (Rose Petal's littermate) had an impressive show season while residing in our herd as a kid, winning his class every time, 1x GCH & BOB (standing in front of their sire Dash who, up until that time, was undefeated himself - Wow!) & 1x RGCH (standing behind another paternal brother) of the 4 times he was shown. is a favorite, standing out from the crowd for her elegance & stylishness - & we’re looking forward to using Renoir more heavily in the future! Be sure to check out other paternal siblings, to see the mammaries & consistent overall quality that Jrufio’s proving to be capable of!